Imtiaz also told followers about the first time she witnessed Goswami play, which made her realize her calling. The India-Pakistan rivalry is known to all. And when it comes to cricket which is followed like a religion, losing is not an option. Well, bleeding blue is mandatory, and our women’s cricket team have not failed us in the ICC Women’s World Cup (currently played in London) as well. This time, India defeated Pakistan by 95 runs and continued to display their brilliant performance. But our rivalry is bound only by the field. 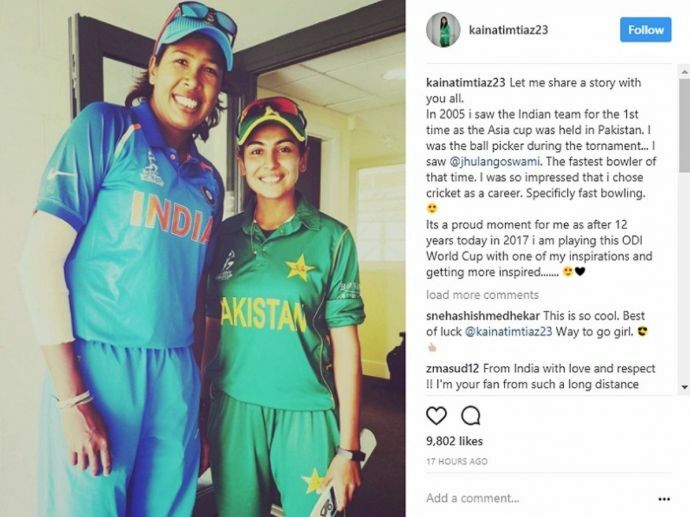 And Kainat Imtiaz’s Instagram post about Indian all-rounder Jhulan Goswami is a manifestation of their respect and admiration for each other. Pakistan's 25-year-old pacer Kainat Imtiaz revealed that she was inspired to play cricket by legendary pacer, Jhulan Goswami. Imtiaz also told about the first time she witnessed Goswami play, which made her realize her calling.